"Ten years from now a hero will fall. Sick of the eternal war with the evil, he or she will make the wrong decision— take the wrong road— and our whole planet will suffer. A DC Comics limited series published in 1991. It was just two issues, but the bulk of it happened in the 1991 annuals. Ten years in the future, one of the Earth's superheroes decides that the world needs order, does a FaceHeel Turn, kills all the others, and becomes an armor-clad dictator known as Monarch. Years later, there is a man named Matthew Ryder who is unhappy with Monarch's regime. When Ryder discovers that Monarch is working on a time-travel experiment, he pretends to be loyal and volunteers for the experiment, which turns Ryder into the time-traveling hero Waverider. Waverider travels to 1991, knowing that one of the heroes of that era will become Monarch. Just by touching any of them, he can see their future ten years later and find which one will become Monarch. 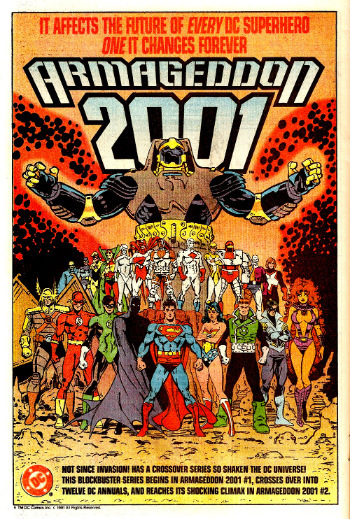 The series was followed by Armageddon: The Alien Agenda and Armageddon: Inferno, the last of which brought the Justice Society of America back from limbo. The Monarch-ruled one from which Waverider comes. The heroes' futures vary between happy and depressing, but L.E.G.I.O.N. has the worst one. Superman had two specifically bad futures in his alternate timelines. In one timeline, he was married to Lois Lane for a short time until a nuclear bomb created by Mannheim of Intergang went off, taking out the entire city of Metropolis, leading to his marriage to Lana Lang and his being a tough crusading enforcer of nuclear disarmament. In another timeline, his wife Lois Lane dies carrying his child, causing him to go off into outer space and fall in love with Maxima, who once pursued him so she could have his child. This last one is less bad since it led to Maxima performing a HeelFace Turn. Superman in the alternate timeline where he loses Lois Lane to a nuclear bomb and becomes a tough rogue enforcer of nuclear disarmament. Blow Gun: In one Batman storyline, The Joker frames Batman for the Penguin's murder by having a henchman shoot a poison dart this way, thus making it appear as if Batman knocked Penguin off a side railing with his Batarang and made the villain fall to his death. Covers Always Lie: The cover of Adventures of Superman Annual vol. 1 #3, the last alternate timeline with Superman, depicts the Man of Steel passionately kissing Maxima atop Lois's grave. One can probably assume the idea is that Superman is heartbroken and Maxima is taking advantage of it. However, this never happens in the comic itself. They kiss several times, but not once near the grave of his dead wife. Depopulation Bomb: Monarch's ultimate weapon used for destroying all superheroes. Captain Atom absorbs all its energy, though, saving the heroes while transporting himself and Monarch back into the prehistoric past. Don't Celebrate Just Yet: In the future timeline where Superman goes off into space after the death of Lois Lane and his unborn child and falls in love with Maxima, his rival Decine threatens to destroy the earth under the pretense that this was what Maxima actually wanted (when it really wasn't). Superman and eventually Maxima show up to destroy Maxima's spacecraft before he could accomplish this task, but as the two of them kiss, Decine in his dying breath tells them that his spacecraft is about to crash down into the earth and destroy Metropolis. Which prompts both Superman and Maxima to use their combined powers to stop the spacecraft and send it hurtling back into space. Doomed Hometown: Metropolis in one of Superman's alternate future timelines. Fallen Hero: Literally the sum of Waverider's knowledge of Monarch's true identity. Green Lantern Ring: In the timeline when Superman became President of the United States, Superman used his will to remove Guy Gardner's Green Lantern ring from his finger when he went rogue and attacked all the superheroes present at a Presidential meeting. Waverider thought this would be what Superman would use to become Monarch, but Superman in that timeline wisely surrendered the ring to Hal Jordan, realizing the wisdom of the adage "absolute power will corrupt absolutely", and continued on with the rest of his term as President with his normal abilities. Joker Immunity: In the Batman storyline, Joker causes the deaths of most of the Bat-Villains, and even dies himself when an attempt to stab Batman ends up with Joker plunging his sword into a power outlet. Love Redeems: Maxima ends up mellowing out because of Superman's influence on her. Waverider determines that since Superman found a Second Love with her in this timeline, he couldn't possibly be Monarch. Man of Steel, Woman of Kleenex: In one of Superman's probable futures, Superman tries to have a child with his wife Lois Lane, but the child causes internal bleeding within the mother, resulting in both of them dying. Mythology Gag/ Recycled Script: One of Superman's alternate timelines is basically a more tragic version of the Superman IV: The Quest for Peace storyline, with Superman using force instead of diplomacy and the goodwill of the nations to eradicate nuclear weapons, and replacing Nuclear Man with the Justice League of America, adding a bit of the Batman: The Dark Knight Returns finale of Superman dueling with an armored Batman as part of its ending. No Celebrities Were Harmed: President Forrest in one of Superman's alternate timelines resembles President George H.W. Bush with Skunk Stripe hair. President Superhero: Superman in one of his alternate future timelines becomes President, based on the technicality that though he came from Krypton, he was born here on Earth in Smallville, Kansas. Replacement Goldfish: In one of the stories where members of Justice League International end up traveling in time to various points of history, Power Girl ends up replacing General Glory's sidekick Ernie when he is killed during World War II. Ret Gone: Waverider's plan was to essentially stop his Bad Future from happening. When he ends up succeeding, his timeline is erased. Waverider himself, however, continues to exist in the reality in which he was stranded. He ends up allying himself with the Linear Men, one of their members being another Matthew Ryder. The Reveal: Hank Hall (Hawk) becomes Monarch. Set Right What Once Went Wrong: Waverider's goal is to prevent the death of the superheroes and the rise of Monarch to power. Monarch's goal, since he can't exist unless he goes back in time to force the superhero that becomes him to fight him to the death, so that he can make sure the future unfolds as it should. Waverider's love of superheroes is due to one rescuing him as a child. The ending reveals that Waverider himself is this hero. Start of Darkness: The entire plot of the storyline is Waverider's quest to find who Monarch is and stop him before he crosses it. He fails to stop the crossing, but because of him coming into the past, he does end up stopping Monarch's plan. Time Travel: The basis for the series. 20 Minutes into the Future: Waverider is from a few decades into the future. Woobie, Destroyer of Worlds: Captain Atom, in the future that was explored by Waverider, loses the last of his family to a violent gang shoot-out. That, and the callous way his family's bodies were treated by the authorities, caused Captain Atom to take vengeance not only on the gangs responsible for their deaths, but on the whole world as well.